Fall and winter is the time of year I love hearty, feel-good, "comfy" meals. Unfortunately, most of these meals are also heavy and calorie-laden. Add in holiday food and the fact that I tend to spend more time indoors, curled up on the couch during winter, and it's really easy to pack on a few pounds at this time of year. I'm still trying to get back to my pre-baby body, and hubby and I are also training to run a 5K, so I've been making an effort to make healthier meals, which is where this lasagna comes in. It's a healthier choice, but still has a lot of the hearty, feel-good qualities of a traditional lasagna. Just as a disclaimer: I believe in moderation in all things, so most of my healthy meals are going to still have pretty "normal" ingredients. You won't find a lot of no-carb, no-fat, no-dairy, no-anything-that-tastes-good here. I believe in balance, and that your body needs a certain amount of all of those things. I am not a fan of fad diets, but I am a fan of making smarter choices every day, which is what you will find in my healthier recipes. Of course, I will continue to offer recipes for not-quite-as-healthy dishes, as well. :) Life is short, and meant to be enjoyed; what better way to do that than with a rich meal or tasty dessert once in a while? Again, for me, it's all about balance. Note: Some ground turkey would also make a nice addition to this recipe if you don't want to make it vegetarian. Just brown it up first and mix it in with the spaghetti sauce, then follow the directions listed below. Mix 2 C of the mozzarella with the cottage cheese, garlic, and balsamic vinegar. Spread a small amount of spaghetti sauce on the bottom of a 9 x 13 pan (to keep the noodles from sticking). Layer in the pan: 3 lasagna noodles, cheese mixture, zucchini, tomato, spinach and kale, spaghetti sauce. Repeat layers two more times. Top with remaining 1 C of mozzarella. Bake for 30 minutes or until heated through and cheese is melted. *These were vegetables that were in season and I had on hand. 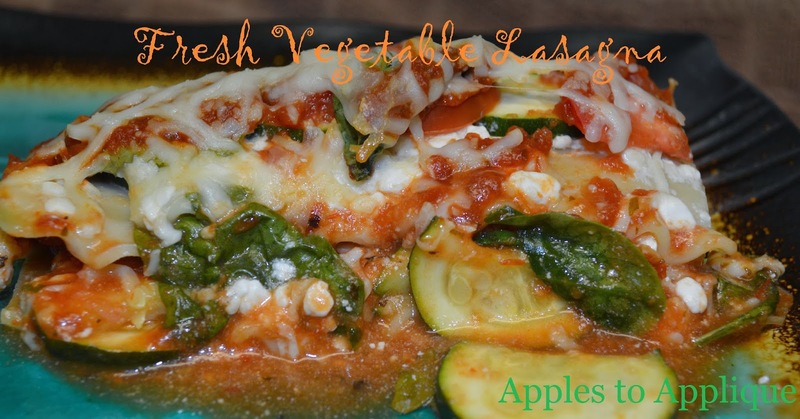 This recipe would be delicious with sliced carrots, eggplant, yellow squash, etc. I also think some fresh basil would taste fantastic added in with the spinach and kale. Mix it up and see what vegetables you like!